“Why didn't most theatregoers think of Paul Scofield in the way they thought of Olivier, Gielgud and Richardson? After all, he had pretty well all the qualities, from Olivier's danger through Gielgud's grace to Richardson's soul, that we admired in the 20th century's most renowned triumvirate. 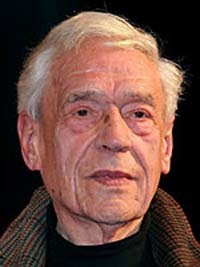 I've never seen Paul Scofield on stage, but I've seen him in a handful of (the few) films he made in the last half century. Scofield, who had been suffering from leukemia, died today in Sussex in the south of England. He was 86. Though mostly a stage actor, Paul Scofield is best known for his (highly theatrical) performance in the 1966 film version of A Man for All Seasons, in which he plays Sir Thomas More, the voice of conscience that is ultimately silenced by Henry VIII. Directed by Fred Zinnemann from a screenplay by Robert Bolt (from his own play), A Man for All Seasons was a major critical success and did respectable business at the box office as well. In the year of the groundbreaking Who's Afraid of Virginia Woolf? and Blow-Up, Zinnemann and Bolt's sumptuous but staid period drama went on to win six Academy Awards, including best film, director, actor, and adapted screenplay. Scofield, however, opted not to pursue a film career and returned to the stage. Among his rare films appearances are those in Terence Young's 1955 costume drama That Lady, playing Spain's King Philip II opposite Olivia de Havilland; John Frankenheimer's subpar 1964 suspense thriller The Train; Michael Winner's 1973 spy thriller Scorpio, which starred Burt Lancaster and Alain Delon; and Tony Richardson's 1973 film version of Edward Albee's A Delicate Balance (top photo), in which Scofield co-starred with Katharine Hepburn and Lee Remick. Also, Clive Rees' 1989 drama When the Whales Came, playing opposite Helen Mirren; Kenneth Branagh's 1989 version of Henry V, as the French king; Franco Zeffirelli's 1990 Hamlet, as the ghost; Robert Redford's excellent 1994 drama Quiz Show, in which Scofield, in a performance that earned him a best supporting actor Oscar nomination, nearly steals the show as Mark Van Doren, Ralph Fiennes' Charles Van Doren's distraught professor father; and Nicholas Hytner's 1996 adaptation of Arthur Miller's The Crucible, playing opposite Daniel Day-Lewis, Winona Ryder, and Joan Allen. On TV, Scofield – as Karenin – was the best thing about Simon Langton's 1985 version of Anna Karenina, which starred Jacqueline Bisset and Christopher Reeve. Born on January 21, 1922, in Hurstpierpoint in West Sussex on the south coast of England, Scofield made his professional acting debut in London in January 1940. He later worked with the Royal Shakespeare Company and the National Theatre. His stage work includes acclaimed performances as Othello, Hamlet, Don Quixote, Salieri in Amadeus, Captain Shotover in George Bernard Shaw's Heartbreak House, and the “whisky priest” in Graham Greene's The Power and the Glory. His 1962 tour de force as King Lear (he repeated the role on film in 1971) was voted the greatest Shakespearean performance ever in a 2004 poll of Royal Shakespeare Company actors. Paul Scofield's Broadway debut took place in 1961 in A Man For All Seasons, a highly praised performance that won him a Tony. Scofield was, however, named a Commander of the British Empire in 1956, and received the title of Companion of Honour in 2001. Thank you? for posting this Europecinema. How I wish BBC would make wonderful programs like this available to Americans! Paul was clearly a man of unprecidented class and I respect him and his performances utterly.if Only I myself could become even half the man Paul was I would be gratful.His life has touched me? and HE was himself a man for all seasons,never to be forgotten. Paul Scofield was a marvelous actor. I'll never forget him as Sir Thomas More in A Man for All Seasons. What a great, intelligent film. It deserved every Oscar it got.